We're proud to announce that the next book in the successful Head First series will cover the incredibly exciting programming language known as Scheme, described by some folks at MIT as "... a statically scoped and properly tail-recursive dialect of the Lisp programming language". Wow! If that doesn't work up your passion for programming, you shouldn't be coding. The four of us have spent the last 3 months secretly writing Head First Scheme, and while the tragically-underappreciated language may not have taken over the world yet, it should and it will. Sure, Java's cool and all, but seriously--can you really trust your mission-critical apps to a language named for a hot beverage? Once again, Tim O'Reilly has proved his savvy (and bravery) in allowing us to do the book we wanted--market size be damned. Preorders will start on Amazon beginning April 1! Order yours now, and await all the tail recursion, closures and Y-combinators you'd ever want. As we've subtitled this book, it is a "brain-based guide to programming nirvana." And we think it's the perfect language for just about anything: teaching, enterprise backends, mobile devices (we even have a tutorial on The Little Toaster--with a Scheme interpreter running on a variety of kitchen appliances), and of course any kind of Web Service. *Sigh*, if only it were so. I'd far rather read about scheme than java. I LOVE your writing in the Head First series, but I despise Java. I've muddled through with the crippled beverage language only because I enjoy your insights into the learning process and your presentation techniques. I've been hoping against hope that you would choose to write a book about Common Lisp...and then you MOCK me with an April Fool's joke about another Lisp family member? Oh, the humanity. For your atonement, you should write a Head First Common Lisp book ;-) I mean it, dammit, get started! Now you've gone and made me sad. Well, a little sad. I'd love to see this book in the real world. I'll admit it, I fell for it. I haven't been here long enough. Maybe Fortran would have tipped the "hmm meter" for me. Too bad it's a joke. I'd buy! Well ya never know, keep the pressure on and we may just have to do this book. ;) Keep cons/car/cdr'ing! Yea, it wasn't really funny, just annoying to find out that there's not going to be a book. have to agree, just pissed me off. More java trash, I guess. I wish it was a real book, too. I happen to know that this is the book Eric and Beth would pretty much KILL to write... but unfortunately, Java is what's kept us alive so far. The market for Java books is much greater than with any other language, and even Java book sales are a mere fraction of what they used to be. This is a very tough way to pay the rent, but we love it. It does mean we're tied to doing things on subjects that have enough people who'd be willing to buy the book. The moment someone can come up with the numbers that suggest there's a large enough market to justify the months that Eric and Beth would be working on it, you can bet they'll be on Tim O'Reilly's doorstep with a proposal! Oh, it is bad that it is only a Joke, I was trying to find where to buy it until I've came back to this place again and noticed it was just joke. The joker deserves an A indeed. Lisp and an eternal student of Scheme. I only read this today, its the 3rd over here now, and my immediate reaction was. Damm did a book without me being involved with the review process. I was not impressed. Luckily reading some of the comments made me realize it was all an April Fools joke. I read it 2 days late but you guys can chalk me "gottha". Good one. Ditto what Kathy said, in fact, I should confess in another life I had the privilege of studying under Dan Friedman (Scheme master & author of such greats as the Little Lisper/Schemer) and hanging around the IU CS department with all the great Schemers there (Dybvig, Springer, etc.). So Scheme is in my blood. I would love to buy this book. This is the cruelest April Fools joke I've seen this year. 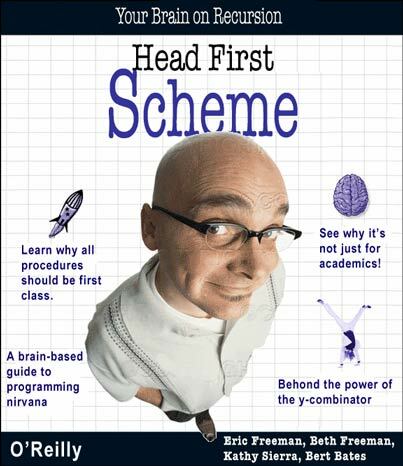 It's a real pity that the Head First Scheme book won't see the market. I believe it can have a future as a teaching book in schools and universities. Anyway, Kathy, could you give a hint about which books are coming out next? Why oh why oh why, was this not real! I decided over the weekend to buy this book, and was desperately searching the oreilly and amazon sites. I put this on my (pen-and-paper) book wishlist before I realized it was an April Fool's joke. Good joke, but I would've bought the book. Looking back I guess putting the Y-combinator on the cover should've tipped me off.